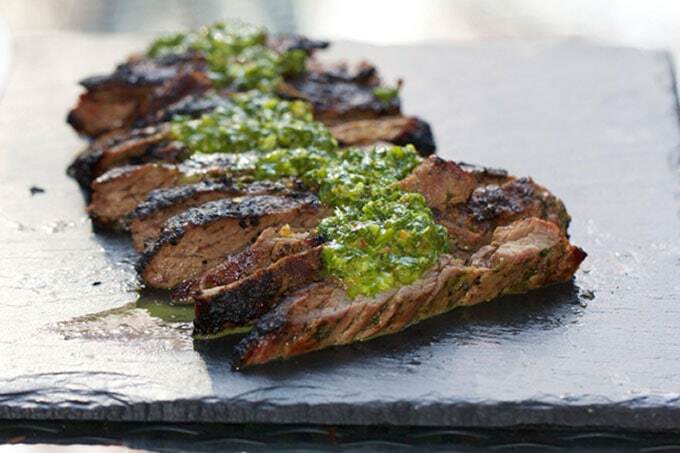 Grilled Skirt Steak with Chimichurri Sauce: A Favorite from Argentina! 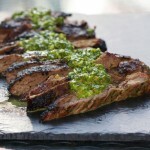 Grilled skirt steak with chimichurri sauce is a fabulous recipe for the barbecue. This vibrant sauce from Argentina is incredible with grilled beef, both as a marinade and to slather on top. I’m just back from a week in Puerto Rico. When I left, my yard was dull and the trees were bare. When I returned it was as if someone had flipped the switch that turns winter into spring. The landscape went from gray to green. My pink Azalea bush was flowering. There was even some action in my herb garden – a little fountain of chives had sprouted up while I was away. All this inspired me to put the cushions on the outdoor furniture, fire up the barbecue, and grill some skirt steak. Skirt steak is a great cut of beef for the grill – rich and full of flavor. 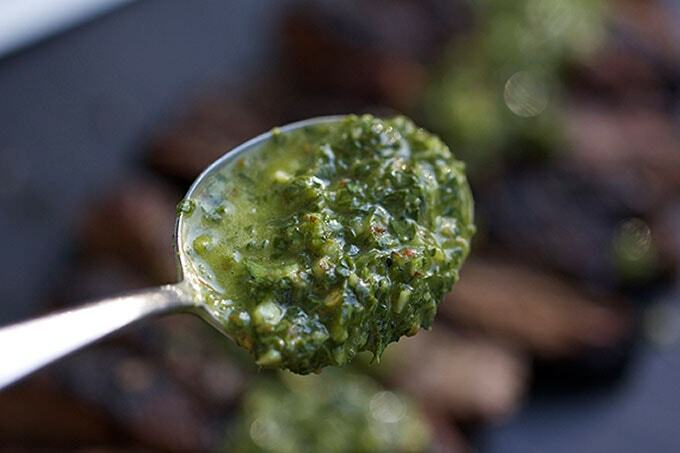 Chimichurri Sauce is the quintessential partner to grilled beef in Argentina, where the beef is renowned and where barbecued beef is considered their national dish. The sauce is a vibrant mix of fresh parsley, vinegar, and spices – very simple and quick to make if you have a blender or a food processor. Slather it on steak, chicken or fish. Use it as a marinade. I love to keep a stash of chimichurri in the fridge to jazz up burgers and sandwiches, too. If you love the vibrant flavors of chimichurri, try this wonderful healthy Chimichurri Broccoli Salad recipe. 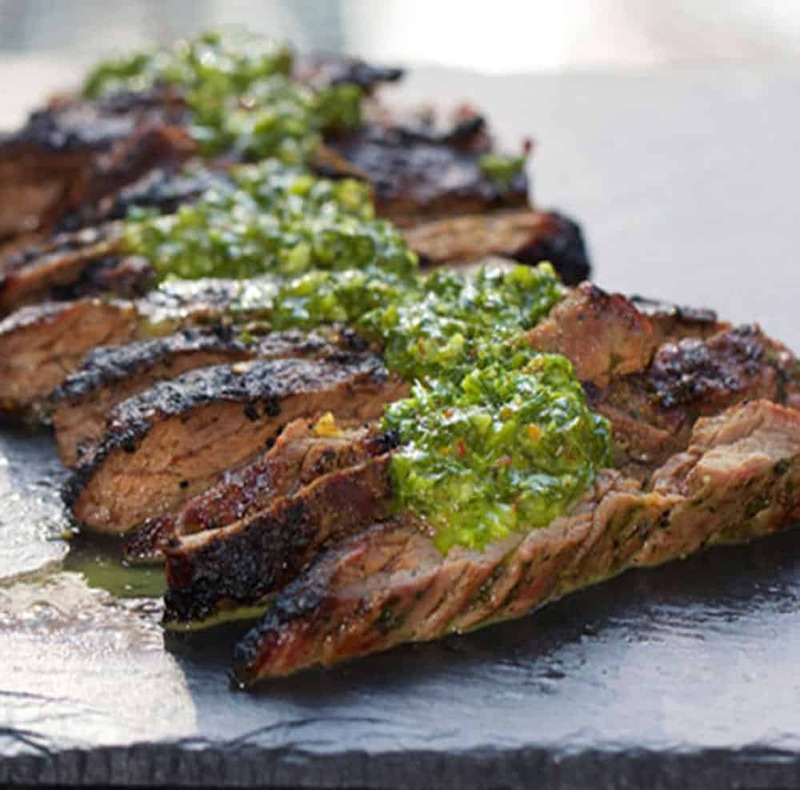 Here’s the recipe for Grilled Skirt Steak with Chimichurri Sauce. If you make this, I hope you’ll come back to leave a comment and let me know how you like it! Put all sauce ingredients into the bowl of a food processor or blender and blend just until everything is combined and garlic is very finely minced. Set aside. Put steak in a non-reactive container. Spoon 4 tablespoons of chimichurri sauce on top of steak and spread it around. Flip steak over a few times to coat. Marinate at room temperature for 1 hour or in the fridge for at least 2 hours or overnight. Allow steak to come to room temp before proceeding (about 1/2 hour out of the fridge) Preheat grill to high. Sprinkle steak with salt and pepper and grill for 3-4 minutes per side (5-6 minutes per side for flank steak), until it is lightly charred on the outside and medium rare inside. Let steak rest for 5 minutes before slicing. Slice against the grain. Spoon chimichurri on top or serve on the side. Enjoy! Note: Sauce is best served at room temperature. It will keep for 2 weeks in fridge. Hurray–it’s finally grilled steak with chimichurri season again! I add fresh cilantro and mint to mine. I’m not sure how “authentic” it is, but it’s delicious. I made this tonight with grilled chicken breasts. It was delicious! It was so easy and it really made “plain old” grilled chicken much more exciting. It had just the right amount of spice and it really brightened up the dinner. We ended up pouring it on the rice and sautéed vegetables too! Thank you for the idea and easy recipe.